Geoff Rose, who plans to open a medical marijuana dispensary in West Tisbury, addressed state commission Tuesday. 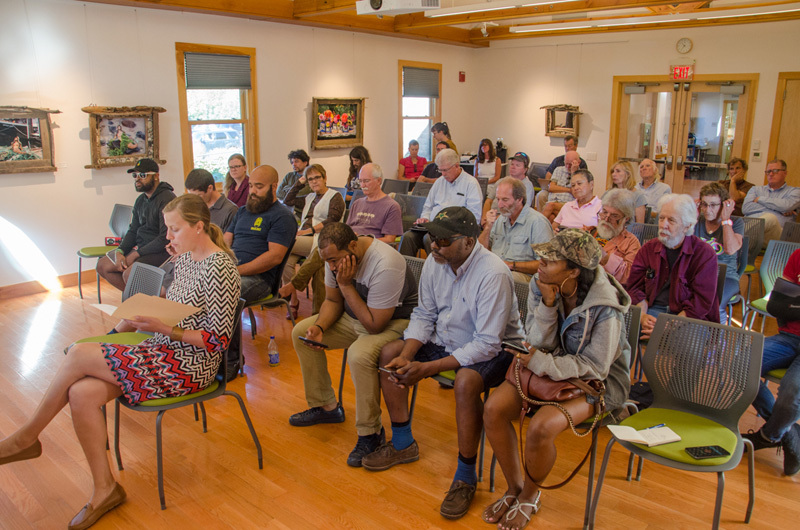 Two members of the newly-appointed Massachusetts Cannabis Control Commission traveled to the Vineyard Tuesday to listen to the thoughts and ideas of Islanders, as the state crafts new regulations for recreational marijuana. 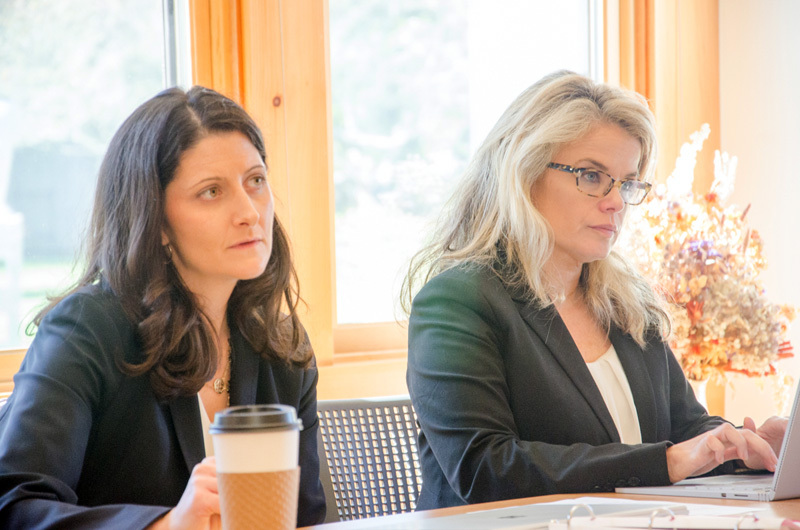 Commissioners Kay Doyle and Britte McBride hosted the listening session at the West Tisbury Library, attended by about 50 people. Last November, Vineyard voters joined their counterparts in the commonwealth, approving a ballot question legalizing recreational marijuana. All six Island towns voted in favor of the initiative. 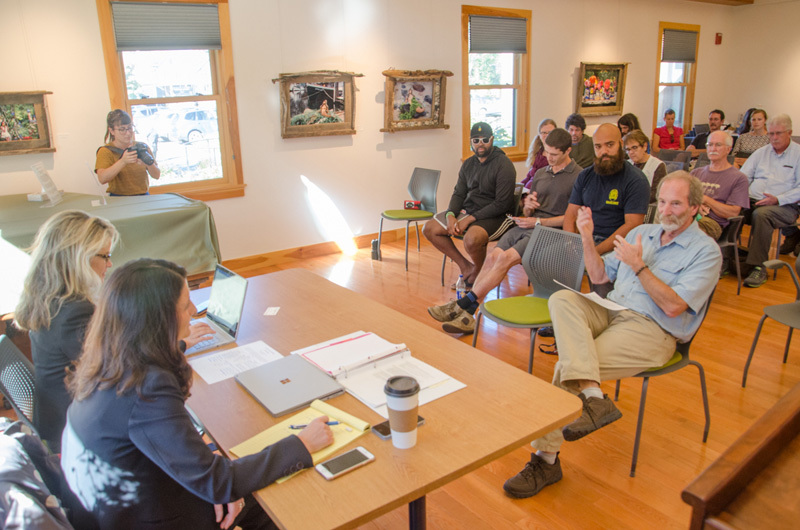 First to address the forum was Martha’s Vineyard legislative liaison Kalea Moore, speaking for state Sen. Julian Cyr and state Rep. Dylan Fernandes. Like other speakers to follow, Ms. Moore stressed how geography creates challenges for the Island. Transporting any amount of marijuana to the Island by sea or air is a violation of federal law, and those who do so risk arrest by federal law enforcement authorities. She urged the state commission to promulgate regulations that allow the Islands the same access to marijuana as the rest of the state. “Cookie-cutter state policy often does not fit the unique geography of Dukes and Nantucket counties,” Ms. Moore said. Island resident Thaw Malin 3rd urged the commission to allow the sale of marijuana seeds and increase the limit of 12 plants per household in the ballot referendum passed by voters last fall. He also advocated use of marijuana in public places such as beaches and parks. Beau Henderson of Oak Bluffs hopes to get a license to operate a recreational marijuana dispensary. He also advocated for enough retail outlets to make marijuana readily accessible to all, as a way to mitigate the opioid epidemic. Several speakers urged the commission to be cautious about legal marijuana getting into the hands of underage users. Among them was Theresa Manning, co-coordinator of the Martha’s Vineyard Youth Task Force, formed in 2004 to educate school-aged kids about alcohol and drug abuse. She pointed to a 2016 survey of Vineyard high school students that found 34 per cent used marijuana, well above the state average of 24 per cent and the national average of 22 per cent. Chris Egan of West Tisbury urged the commission to preserve the rights of those who do not use medical or recreational marijuana. He opposes a medical marijuana grow facility slated to be built in West Tisbury and operating by next fall. The state law allows possession of up to one ounce of marijuana by people 21 and over, with the right to grow up to six plants. Up to 10 ounces and 12 plants are allowed per household. The state legislature later modified the law, among other things raising the tax charged on marijuana sales from 3.75 per cent to 10.75 per cent. Once the 6.25 per cent state sales tax is added in, marijuana sales will be taxed at 17 per cent. Each town where marijuana is sold will have a local option to add an additional two or three per cent tax. The legislature also delayed implementation of the law to July 1, 2018. The Cannabis Control Commission began accepting applications for retail recreational dispensaries this month. The commission expects to take at least a year to develop regulations. We don't need anymore easily obtainable drugs on this island than we already have.This guy is touting all the benefits because he will make a fortune ,how many people on this island need pot for medicinal purposes, and those that do can get it with a prescription for pot or marinol in pill form which boosts appetite just like the stuff you smoke. so we don't need a walmart size place to dispense pot. How do you feel about alcohol sales? Both are legal products in this state. Both can be harmful and or good. Whenever I hear these claims that marijuana is going to somehow ruin society or put strain on emergency services my first thought always goes to alcohol. Let's take a survey of households and municipalities on the Cape and Islands. How many households have been deeply effected by alcohol? How often are emergency services including police and ambulance needed for alcohol related events every year? How many underage children are effected by alcohol? Then ask the same about marijuana. Marijuana legalization is taking a thriving underground market and making a substantial tax base. At the same time we are eliminating good people from being arrested and carrying the stigma of enjoying marijuana. Educate the children about the risks and focus law enforcement on those who truly deserve the attention. Regulate the sales, tax the transactions, test for mold and pesticides, educate the children, focus law enforcement on real criminals and enjoy our well fought freedoms.